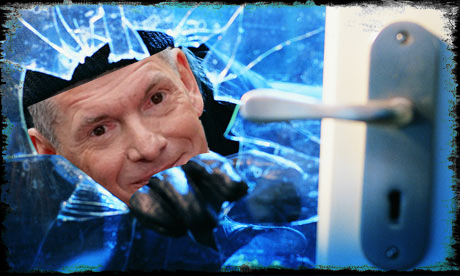 Headlies: VINCE MCMAHON TO BEGIN BREAKING INTO HOMES, FORCE EVERYONE TO PUT ON RAW - WrestleCrap - The Very Worst of Pro Wrestling! Stamford, CT – After the October 1 edition of Monday Night Raw scored an abysmal 2.5 rating, especially compared to Monday Night Football’s 6.8, things have gotten tense at Titan Tower. 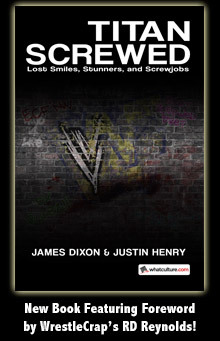 WWE CEO Vince McMahon was said to be disconsolate and frustrated after his flagship show, the one WWE’s Did-You-Know asides consistently brags about the ratings victories of, continues to bottom out, especially against the very NFL he once tried to compete against. During a recent brainstorming session at WWE Headquarters, Vince McMahon angrily declared his intention to begin breaking into viewers’ homes and making them put on Raw. He was apparently not joking. According to the staffer, McMahon’s strategy is to kick open random front doors, trudge in with a sledgehammer, and intimidate the residents into switching their TVs to Raw. Vince allegedly went on to discuss scenarios where he would slide down the chimney in a Santa Claus costume covered in WWE logos, and politely knock on the door in religious attire, telling them that whatever overlord they believe in encourages them to watch Raw.